If you didn't get the chance to while you were here, Please take our Vistor Survey. 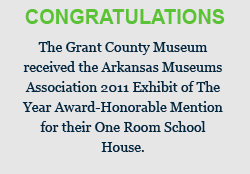 Welcome to the website of the Grant County Museum! The museum, established in 1965, is an agency of the county government. 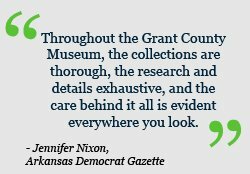 This local history museum, whose stated purpose is to interpret and preserve the history of Grant County, traces the county's economic and social development from prehistoric to present times. 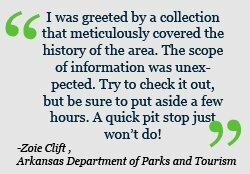 The artifacts, displays, and exhibits you will see here required thousands of hours for collection and preparation for presentation. We, the residents of Grant County, are quite proud of our timberland heritage and welcome the opportunity to share the colorful and exciting history of our community. Take your time and stroll down Goolsby Street. You'll be swept back in time in Heritage Square. 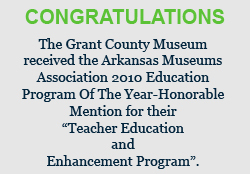 Tuesday thru Saturday, 9:00 - 4:00 P.M.
Non-residents of Grant County is $3.00 for adults and $1.00 for students. Our staff is eager to assist in your research and welcomes your questions, comments, and by all means ...your suggestions!